"I just received my adorable Dooney Palomino Barrel Bag about an hour ago. "I just received my restored Dooney handbag in the mail today. Thank you so much for doing such a great job!! "Thank you oh so much. Linda says perfect match to shoes she purchased. The bag came right on time. She's going away this weekend. Again I say thank you. Will let everyone I know about your website. "- April 2016; Arlene C.; New York. "Hi Joanna! I had a very pleasant buying experience with Vintage Dooney. Joanna's excitement and love for Dooney and Bourke products is obvious and somewhat contagious! She was very quick at getting back to me and exhibited much patience with this PayPal noobie. I would definitely buy from Joanna and Vintage Dooney again! 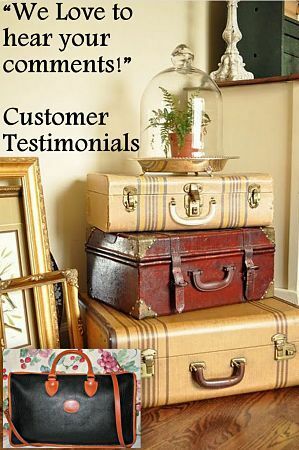 Loralie"
"It was such a pleasure to do business with you. The AWL Vintage organizer was just what I had been searching for. And the condition was just as described. It's such a delight to have a quality organizer and a Dooney to boot. My best, Mary C"
"I’ve been a Dooney faithful right from the first bag my Mother purchased for me back in 1985. I still have that bag. That is why I am forever grateful I found VintageDooney.com." My cousin and I joked; “we have many bags on this site” one day while visiting the web site. This just goes to show how proven a product they are. The service from VintageDonney.com is superior. If they cannot assist with or find the bag you want, they help put you with those who can. If you are hesitating for a moment whether to purchase, out not, go on; “add to cart”. "-Ann, Atlanta GA.
"Hi Joanna, my vintage Dooney equestrian arrived and it is fabulous! I fell in love immediately. Thank you for the fast delivery and the pretty wrapping that kept my Dooney safe on its journey. The bag is just as you described on the website. I really appreciate the craftsmanship of this "made in the USA" Dooney, and its lovely "lived in" patina. I like having a bag that is both classic and unique and that I won't see on everyone else. I am already daydreaming about another vintage Dooney for my collection.Thanks again, Stacie (from Nashville, TN)"
"JoAnna, It was so nice to discover Vintage Dooney and to meet you via email. You offer a great selection of handbags and I’m so happy I found the zip around wallet on your website since DB has discontinued making it. The wallet was just as it was described and in perfect, almost new condition. Your prices are very reasonable and your quick response to ALL my emails made dealing with you a wonderful experience. I’m especially glad I didn’t have to stay up until midnight bidding on that “other” website. I’ll be back again, many thanks, Polly (from Ky.)"
"The most important comment I wish to make is that your descriptions are accurate and as a first time customer, was very happy with my purchases and items were as described ( on your website). " -Carol M.
I love the purses I purchased from you! Fast Shipping, great products, great prices. Thanks! -Kay K.
My Bag arrived beautifully wrapped and is even better than the pictures! -S.V.